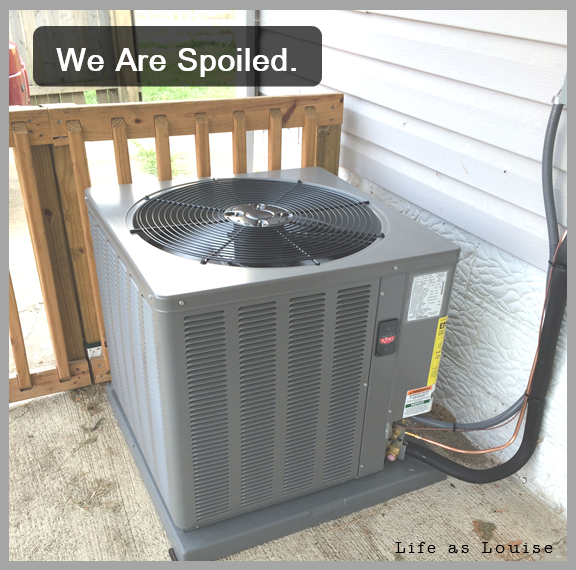 On Wednesday my husband and I finally took the plunge and put a central air conditioning unit in our house. We moved into our house almost two years ago and the past two summers we’ve relied on two window units (one in the living room, one in our bedroom). They did a great job, but in July our bedroom unit broke and we immediately spent $200 to replace it. Well, halfway through August the living room unit kicked the bucket. This window unit was going to be WAY more expensive to replace because it was a bigger engine/fan (?) that cooled the entire first level. K and I decided it was time to discuss a whole-house air conditioner. Knowing that it would increase the value of our house slightly and most certainly bring a whole new level of comfort, we decided to go for it. Our Husky mix thanked us in advance. In comparison to a new window unit (which we were told are not made like they used to be and would only last 3 to 4 years… ain’t that how it always goes? ), spending the money on a central a/c unit was the better choice for us. But now I feel like a small, rustic piece of me is missing. But I do feel spoiled because so many people live without a/c. I did for a few years in college. My parents’ house didn’t have it for the longest time. I spent 4 weeks in India (which is a very hot country, if you were curious) and only had a/c in the movie theaters. Honestly, by Wednesday I was fairly used to the heat. Then again, that new a/c unit sitting on our back patio is a real beauty. Leaving the vents unobstructed all year round (instead of just Nov. through March when the heat is on) will be kind of nice. And my Easter get-togethers and summer parties will be a little more enjoyable now. So instead of feeling spoiled I guess I will look at this as a blessing. Because it really is and I’m so thankful we could do this. Now we can break up the monotony of the “you take the dog out” fight with a “turn the air conditioner up/down!” argument! Do you have central a/c? Have you ever gone without a/c? How do you cope with no air conditioning? I can’t imagine living without an AC! Congrats on getting yours! This week has been especially brutal. I am so, so, so glad to have it right now! !